Life is a journey for everyone. For all who have trusted God’s Son for life eternal and life in all its fullness, we not only follow Christ, but the destination of our journey takes us into more of Christ. Below are a number of free opportunities for you to explore and experience more of what this Christ Awakening journey can mean for you. If you’ve never heard of a Christ Awakening, you can learn about them here. With compelling teaching, creative visuals, and clear applications, The Christ Institutes Video Series explore major themes on what the supremacy of Christ means for you today. You can watch the videos at your own pace, individually or with a group. The nine videos will expand your vision of Christ by looking at who Christ is to us, for us, over us, before us, within us, through us, and upon us. You won’t see Christ the same way again. A Participant Guide is included. Sign up to receive an every-other-day emailed video clip to help you dig into the spectacularly supreme person of Christ. You’ll learn vital biblical truths about Christ as you discover who he is in magnificent ways you may have never imagined. 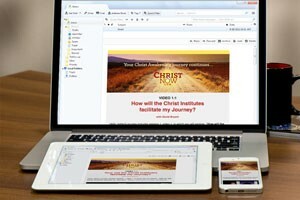 Each email includes a video clip from The Christ Institutes Video Series (TCI). This will give you the opportunity to spend 20-30 minutes on that day getting reacquainted with the greatness and glory of Jesus today. (A built-in one day break between each video clip will help you catch up if you miss viewing a session.) In exciting and unique ways this guided 55-session approach will permanently enlarge and deepen your daily walk with God’s Son. In addition to the Christ Awakening email series and The Christ Institutes Video Series, this website provides resources to take you further in Christ. There are daily devotions based on the names of Christ, artwork that captures the beauty of Christ, music videos to help you worship Christ. Take time to read the Scriptures that elevate Christ, teaching videos that explain Christ, and more. Also explore the wonders of Christ through our growing content library.